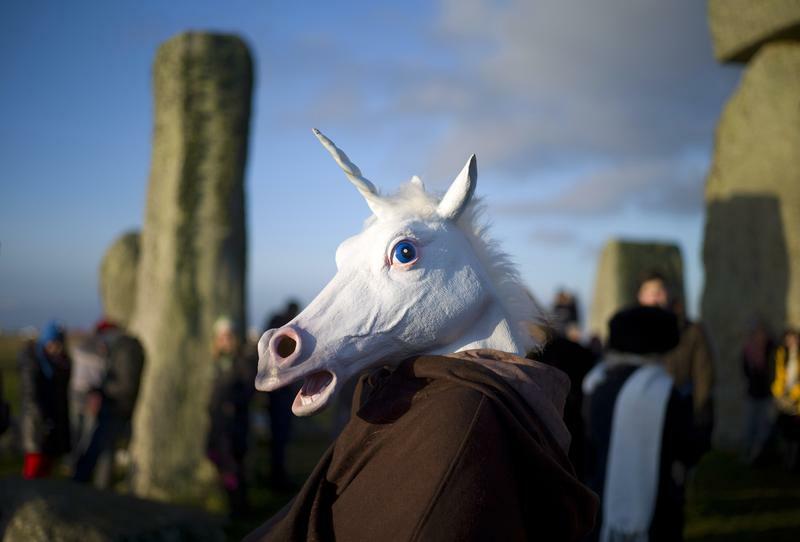 A reveller, dressed as a unicorn, celebrates the sunrise during the winter solstice at Stonehenge on Salisbury Plain in southern England December 21, 2012. The winter solstice is the shortest day of the year, and the longest night of the year. Indian hotel startup Oyo said on Sept. 25 it had raised $800 million in a funding round led by a unit of Japan’s SoftBank and received an additional commitment of $200 million. SoftBank Investment Advisers, through the SoftBank Vision Fund, was joined by existing investors Lightspeed Venture Partners, Sequoia and Greenoaks Capital. Oyo, which started in 2013 and offers over 211,000 franchised and leased rooms, said it would use the money to expand in India, China, Malaysia, Nepal and the United Kingdom, as well as to invest in technology and hire staff.